In the long running and rather popular series, the time-traveling Grantville community start their own military force, which than combines with Gustavus Adolphus' mainly Swedish army and navy and, with the addition of newly raised units becomes the United States of Europe's Armed Services. There are a few mentions of NCO's and officers wearing US-style insignia, but I was wondering, how the system would have looked. My guess is that the base would be the US-system, but simplified (i.e. closer to the British one in number of NCO ranks) and with some European influences, too - after all, the Grantville Library did have at least one copy of the Encyclopedia Britannica and probably of some additional encyclopedias, too, while in the same time we know that there were military history buffs among the community. Miklós Lovász wrote: In the long running and rather popular series, the time-traveling Grantville community start their own military force, which than combines with Gustavus Adolphus' mainly Swedish army and navy and, with the addition of newly raised units becomes the United States of Europe's Armed Services. Haven't read the series, but based upon your post, I'd say the (former) Canadian system would be a good system to mimic. Army enlisted and Navy officer ranks, perhaps omitting some positions for ease of insignia manufacture. Knowing how they fight (like their now contemporaries or like a 21st Century force) and what weapons they use (period weapons or modern) could play a factor. If they fight like 1632ians then brighter colors for ranks and uniforms(with differing cuffs, and/or collars, trousers, etc.) would likely be used. If they are more modern in their thinking/gear, 'camouflage' might be used. Private. The clothes on their back, maybe a uniform, or a uniform color. Blue, maybe? Lance corporal through sergeant, 1 to 3 chevrons. Sergeant major. An officer's 'uniform,' whether it's just a darker shade of blue, or a gorget, or simple a breastplate. Maybe with a sergeant's three chevrons. Second lieutenant through colonel would wear the naval stripes. Generals may use flag officer stripes, or may simply use stars. Of course, if I were doing a complete ... kitting out, I guess, of the USE forces, I'd do something a bit different. The (forest/woods/etc.) 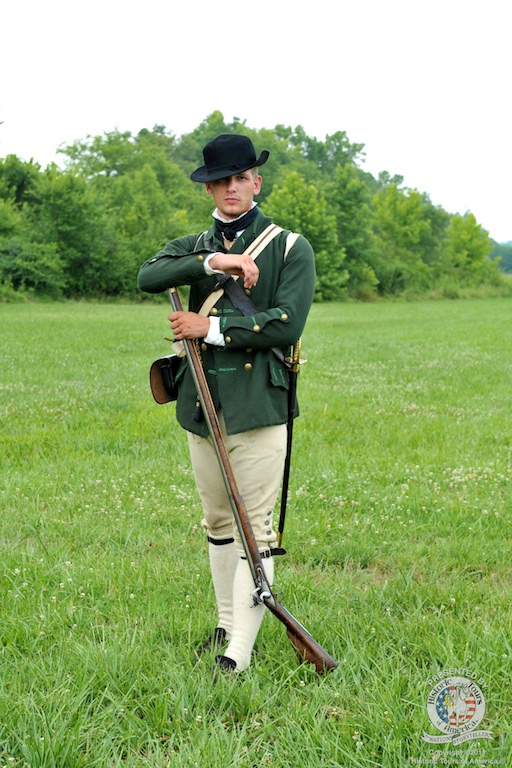 uniform would be a double breasted 1700s Colonial hunting shirt (or a Western 'mountain man' or Native American buckskin getup) in terrain appropriate colors. The piping, thread used to sew the pieces together, etc. would be of a darker shade of the fabric. Collar, lapels, turnbacks, and cuffs would be done in a similar nature, but reversed. So the shirt would be light green, the piping and threads dark, while the collar and cuffs would be dark green with light green piping/treading. If the buckskin is used, the tassels would be of darker green material. Brown trousers with dark brown stripes down the sides, and the front and rear. Dark brown tassels would be used if the buckskin getup is used. Rank insignia would be black (or dark brown) and limited to the collars and cuffs. Privates (I'd likely term them volunteers, or soldiers)would wear the uniforms alone. Lance corporals (I'd likely call them (fire)team lead(er)s)) would wear one bar/ring. Corporals (I'd likely call them squad or section lead(er)s)would have two. The other ranks simply increase the number of bars. Ensign, one bar. Or a gorget, with the number of bars being one less for lts. and cpts. Commander, 1 thicker (composed of two or three stripes touching/overlapping. Major, 1 thick, 1 thin. Colonel, 1 thick, 2 thin. Brigadier, two thick, 1 thin. General, two thick, 2 thin. Marshal, two thick, 3 thin. I'd prefer to keep ranks unique whenever possible, hence the lack of second lt, lt. colonel, etc. A conventional system wouldn't be ruled out, though. An alternative rank scheme would use different colors to denote the ranks. All of this is contingent on manufacturing capabilities. This would be the starting point. Make it a shade of green appropriate to the geography, with the ruffles being darker. It would have a functional folded down second collar for the cold (the ruffles by the collar would be the fold down collar) and a cape (the ruffles overlapping the shoulders) for rain or snow. The belt would be the same color as the shirt,with the ruffles being darker. The cuffs of the hunting shirt would be able to fold down, like the ones in the picture. The lapels/turnbacks would be incorporated with ruffling around the borders. Reverse the greens and darken the trousers for my ideal coloration. If you look at the trees in the background, the lighter shade of green is more common than the darker. Ultimately, the idea would be camouflage-oriented for a force meant to fight from the trees, sniping at officers and causing chaos. There are some indications in the books, but nothing detailed. In the USE Navy, the first CNO (Admiral Simpson) made his own rank insignia (stars) and handed out bars to LT Canttrell. The first head of the USE Air Force (Col. Woods) wore eagles and his officers/NCS's wore US insigni (or so is hinted). Also, only at the beginning are insignia mentioned, not in later books. That last pic of yours is catchy ... might be very well the basis for a new uniform ... perhaps if Medic looked around ...? Miklós Lovász wrote: There are some indications in the books, but nothing detailed. Medic would be a good bet for whipping something up that looks good. I'd try my hand, but am awaiting (likely bad) news so am somewhat preoccupied. Thanks for the info on the USE ranks. Any idea about uniform color, of the USE or Gustav's army? I don't know if proper uniforms were worn then, and if so, by whom, but that would help. Depending on what insignia was available (metal, cloth, gold, silver, black, etc.) and the fact that there were mil-history buffs in Grantville,there's a lot of variables. Revolutionary insignia consisted of green epaulettes for corporal, red for sergeants. Fringless and fringed epaulettes, solitary or alternating, for the officers and/or colored cockades, with stars being utilized during the war. Use of bars, oak leaves and eagles (the eagle was fist, I believe) came later. Early officer rank insignia was chevrons on the cuff. I think it's safe to assume that there weren't too many liberties taken, likely the shape/style of the eagle (maybe a 'German' eagle) or the number of points on the stars, 4 or 6 or 7, etc. instead of 5. One chevron for privates(first class) or lance corporal and two and three for corporals and sergeants. Company Quartermaster/Supply/Commissary/Clerk/etc. Sergeant and company sergeant major. Likely called first sergeant and bearing a modern day staff sergeant's insignia, three chevrons and one arc under. Battalion QM/etc. Sergeant and battalion sgt. major. Likely just called sergeant major, and having an additional arc. Regimental QM/etc. Sergeant and etc. Likely called a command sergeant major. Three chevrons and three arcs. The arc may simply be replaced with a bar due to material availability. Ultimately, what the NCOs do (and their numbers) will make it easier to identify ranks. Revised titles for post sergeant ranks could be platoon sgt., 1st sgt., and sgt. mjr. I'll see if I can find the books on Baen's site, or on the hosted CDs, but I don't know if I can find anything. I would agree with chevrons ... how about the O ranks? The uptimers would go with the 5-pointed sters, eagle (as worn by COL Woods, USEAF) and bars ... but what about the downtimers? Especially the downtimers who accessed the encyclopedias with all the pics of German and Swedish insignia? Miklós Lovász wrote: I would agree with chevrons ... how about the O ranks? Well, on one hand, the up timers might ... sway the down timers to adopt USA insignia. I haven't read the books, so I'm not aware of the up timer and dwn timer politics. On the other hand, there may be adaptations to the US system, based on necessity. Do you know what the German and Swedish systems were at the time, by chance? I could guesstimate that they were both weapon and or gorget based, but I could be wrong. I was actually thinking the other day that some US police departments use an exact copy of US military insignia, while others modify it, such as using a golden eagle. That got me thinking. Based on the units, departments, etc., as well as who supplies them, there may be a hodgepodge of insignia used. For instance, a colonel may use gold or silver eagles based on availability. Lt. colonels may be differentiated from majors by, say, the uniform they wear. The same may be true for lts. and captains. One to three bars for company grade officers, maybe using sleeve lace as well/in addition. Majors and lt. colonels would wear oak leaves, perhaps with a lt. colonel wearing a different collar or cuff. Colonels would wear the eagle. I have no idea what the German od Swedish system was at the time .... if there was one, at all. My point is, that in the books there seems to be a ... call it "rift" betwee the uptimer dominated branches (AF and Navy) that go mostly with the US insignia and possibly the Army, with a lot of downtimers. Also, the Swedish navy seems to stand alone, while in the Army the units are either "Old Guard" or swamped with CoC members, while no clear indication exsits as to a centralised regulation regarding insignia. MEDIC, where are you hiding???? We need you! Hip-hip-hurray! You're here! Could you please get back to the saving-the-world bussiness and do something awesome about the debated issue? Pretty please with a lot of sugar in it? I have a lot of background reading to do if I'm going to be able to contribute to this -- I don't know the source material at all! Do you have any quotes or references from the series? Medic_in_Uniform wrote: I have a lot of background reading to do if I'm going to be able to contribute to this -- I don't know the source material at all! It's the first one, 1635 and the Baltic War. They used to be legally available online from the same site, but some of the authors had issues, and now you have to download them. It's still legal to download. The titles are listed here http://baencd.thefifthimperium.com/23-TheEasternFrontCD/1635TheEasternFrontCD/ and here http://baencd.thefifthimperium.com/13-T ... lticWarCD/ . It appears that the 1635 .zip is the most up to date, but I figured it'd be best to include both.